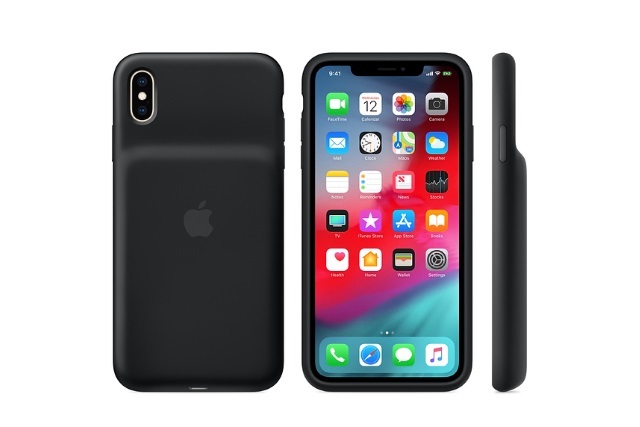 Apple has finally launched battery cases for the iPhone XS, XS Max and XR. These new Apple product protects the iPhone device and as well, provide extra battery power for longer usage. Priced at $129, these Smart Battery cases don't come cheap but does serve it's purpose. One very important feature of the newly launched Smart Battery cases is its support of wireless Qi charging and lightning accessories. Apple says the Smart Battery Case be charged even faster with USB-PD compatible chargers. "The Smart battery cases gives you even longer battery life while offering great protection," Apple said. "Inside, a soft microfiber lining helps protect your iPhone. And on the outside, the silky, soft-touch finish of the silicone exterior feels great in your hand. A soft elastomer hinge design makes it easy to put the case on and take it off." When the iPhone user has the Smart Battery Case on, the intelligent battery status is displayed in the Notification Center, and as well as the on the iPhone Lock Screen so as to show the user how much battery percentage that is left. The iPhone XR Smart Battery Case offers up to 39 hours talk time, 22 hours Internet usage and up to 27 hours video playback. The iPhone XS Smart Battery Case offers up to 33 hours talk time, 21 hours Internet usage and up to 25 hours video playback, while the iPhone XS Max Smart Battery Case offers up to 37 hours talk time, 20 hours Internet usage and up to 25 hours video playback. The cases are available in white or black option, have the same price, though their performance differs.